Soft, tender cupcakes, sewn with rich apple flavor. A buttery, gooey caramel center with a just detectable salty finish. 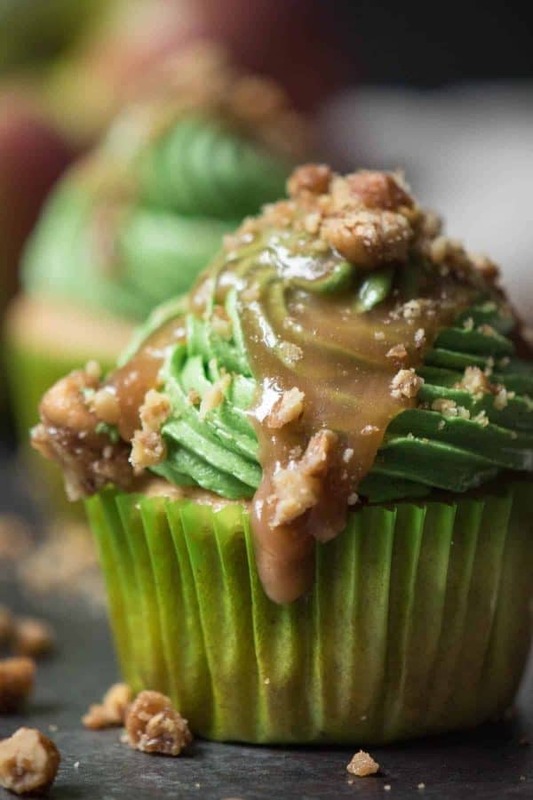 A sweet, fluffy buttercream topped with dripped salted caramel and candied walnut pieces. Your first bite laced with childhood memories of messy caramel apple eating. Creamy caramel, crunchy nuts and a burst of apple on the finish. 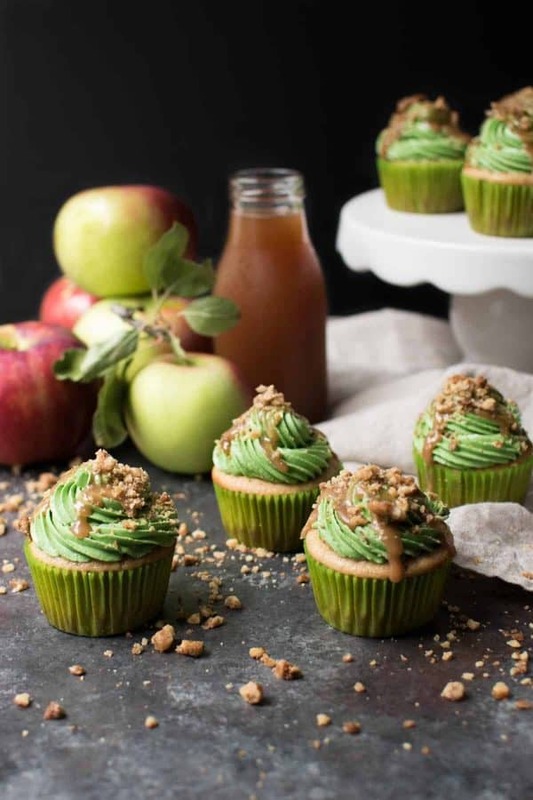 Let’s celebrate fall with Caramel Apple Cider Cupcakes. Oh hey there October. How ya doing? Unseasonably warm? Ya, we know. But while your ridiculously warm weather makes that tree hugging part of my brain cringe, if we can reap the benefits of a bountiful apple harvest, let’s make the best of the situation. The best of the situation? All the apple things. For a quick minute we’re switching gears over here and putting the pumpkin on hold. Apple, please come and get your time in the spotlight. 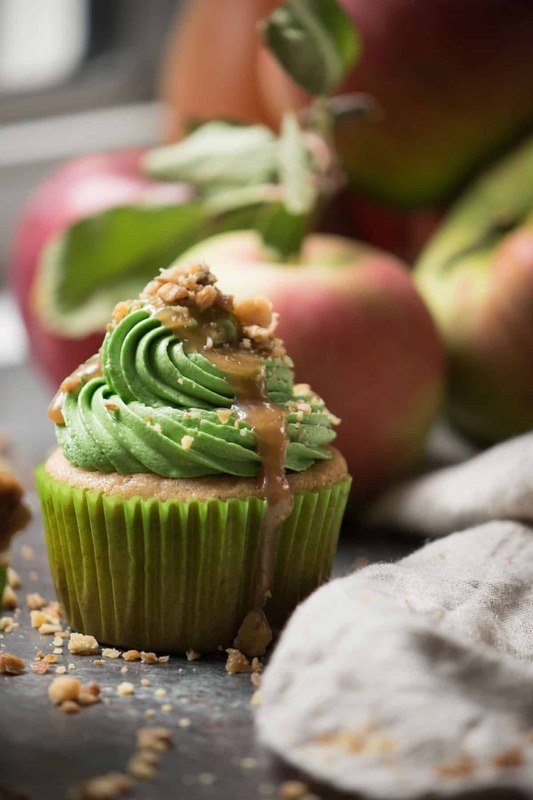 These cupcakes are seriously bursting with apple picking flavors. Apple cider in the batter brings pungent sweet, apple flavor. If you’re new to cider, it’s very different than that of it’s Apple Juice cousin that my toddler loves so much. 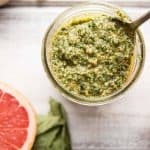 Its slightly sweeter with a little bit of an earthy flavor. If you could turn the smell of an orchard into a beverage, that’s apple cider. Ok, ok, some companies claim it’s just the label that’s different. But not in Massachusetts. Because we’re so extra about our apples in this state we legit have a page on the MASS.gov website defining the difference between apple cider and apple juice. For us, it’s mostly the process. Apple cider is the raw juice from the pressing of the apples. No filters, no pasteurization. Pure, unadulterated apple goodness. 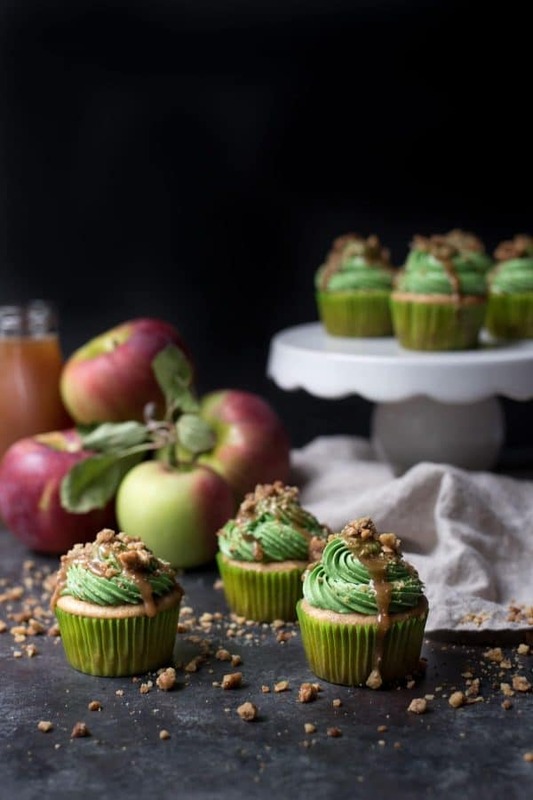 And if you add it to a cupcake, Caramel Apple Cider Cupcakes, you’re going to get apple goodness twelve times over. 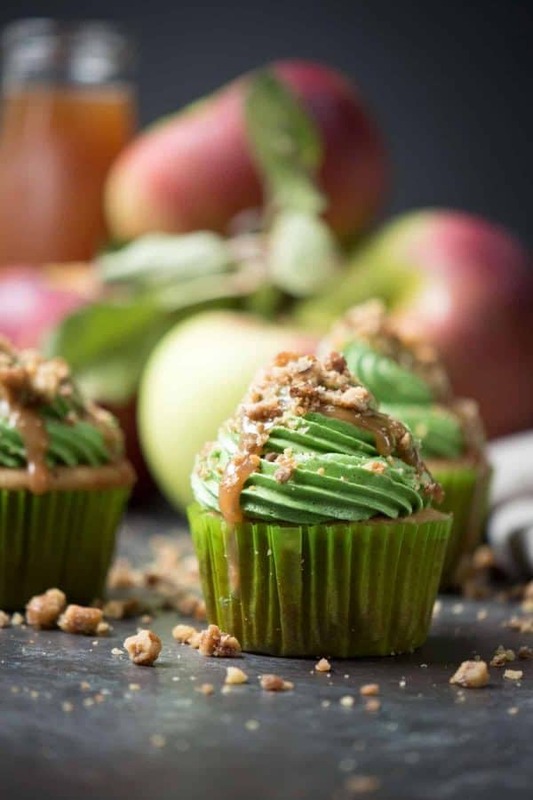 For these Caramel Apple Cider Cupcakes you’ll want your cake to taste like apples and your cupcake to look like a caramel apple. The combination of apple cider, salted caramel and a little help from some food dye is going to get it done. Once your cupcakes are baked, hollow out the center to pipe in the gooey caramel center. There’s a fancy tool that does this, but you can take the low-budget hack if you’d like. To avoid an extra tool in the tool box, take a piping tip – preferably a large star tip – insert into the center of the cupcake and give a slight turn. Voila! Hollowed cupcakes. Fill with caramel and whip up some traditional buttercream to top these lovelies. American buttercream does tend to run on the sweet side. If you prefer a less sweet frosting, try making a Swiss Meringue Buttercream, like this one from the good folks over at Foodal. Didn’t get enough apple just yet? Fill the feast with it! 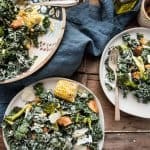 We’ve been in apple heaven over here with this Fall Honeycrisp Collard Green Salad, followed up with Apple and Sausage Stuffed Pork Roast and sipping ‘ Jrdo some Red Wine Cider Sangria. ::SIGH:: Isn’t it a wonderful life we lead with all this beautiful food? 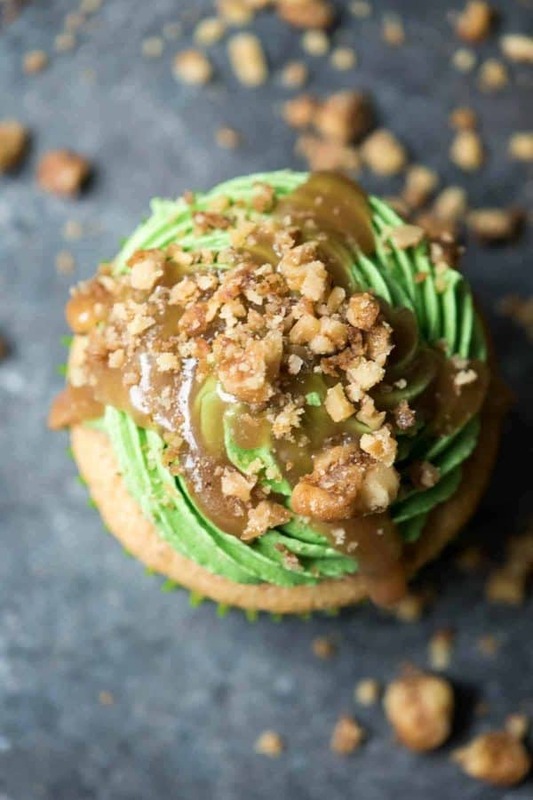 With caramel in your piping bag and frosting on your cupcakes, drizzle a little on top and sprinkle with some crushed nuts or sprinkles to resemble your favorite childhood caramel apple. Take a bite and enjoy the sweet satisfaction that this is dessert bliss with a caramel center, never to be left with just an apple. Sweet buttercream sits atop tender, soft cake with a creamy, gooey caramel center. Drizzled with caramel and sprinkled with crushed walnuts to mirror your favorite childhood caramel apple. Preheat oven to 350°F. Line a cupcake tin with liners and set aside. In a medium size mixing bowl, combine all-purpose flour, baking powder, salt, cinnamon, nutmeg and clove. Whisk until combined and set aside. Cream together butter and sugar in a mixing bowl on medium speed. Add eggs and vanilla, mix on medium speed for 1 minute, scraping down the sides of the bowl. Working in 3 batches alternate adding dry ingredients and apple cider, starting and ending with the dry ingredients. Mix on medium speed until incorporated, about 1 to 2 minutes. Using a large cookie scoop or spoon, fill the cupcake liners 2/3 of the way full. Bake for 20-22 minutes. Beat unsalted butter, on medium high speed for 2 minutes until pale yellow and fluffy. Add half the confectioners sugar and mix on low speed until incorporated. Add remaining confectioners sugar and vanilla, mix on low and slowly increase speed to medium, scraping down the sides of the bowl. On low speed, add apple cider and cinnamon. Incorporate on medium speed. Add cake dye colors in batches, mixing well before adding more cake dye gel until your desired color is achieved. Will yield about 4 cups of caramel, allow to cool nearly completely (about 15-20 minutes) and add 1 1/2 cups caramel to a small piping bag. Cut off a large enough tip to fill the cupcakes, but not so large the caramel will drip all over in between cupcakes. Piping bag may be hot, have a kitchen towel available. Using a cupcake corer tool, or large star piping tip, core the center of the cupcakes. Fill with salted caramel. Let settle, adding additional caramel if needed. Transfer buttercream to a large piping bag fitting with a large open star tip. Pipe three swirls on top of each cupcake. There will be enough buttercream to frost the cupcakes as seen in the pictures. If you plan to use less, cut the buttercream recipe in half. 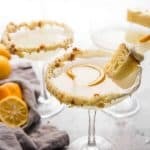 Apple cider in buttercream is unpasteurized, store overnight in a refrigerator. Caramel melts can be substituted if you do not want to make your own caramel. These should be available in your grocery store baking aisle. Wow I definitely need to try these! I don’t know if I could make them this pretty but I bet they would still be good! OH my goodness these are so cute! I love the green icing it really adds a pop of color! I will have to try these out. Oh. Em. Gee. These looks sinfully delicious!!! can’t wait to make em! These sound so good! We love Apple Cider at our house, so I’m definitely saving this recipe for later! Oh my god they look amazing. Think I may have to try and make them. Caramel apple everything, please. 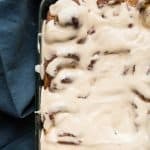 These look SO good- fall treat perfection! 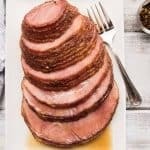 Reading the recipe alone made my mouth water. 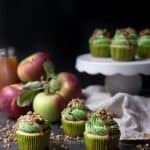 I love cupcakes and I LOVE apple cider so these are totally a must try! Yum, these look and sound delicious! Apple treats are my favorite this time of year! 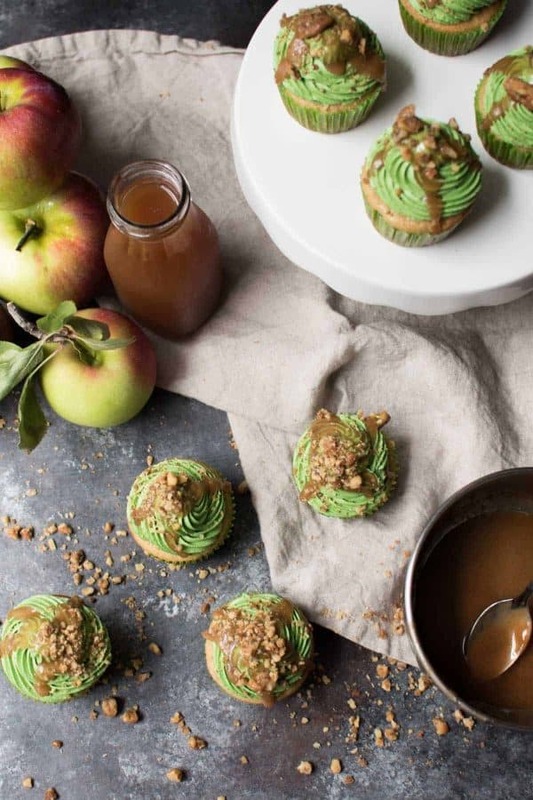 Caramel apples in cupcake form?! Brilliant!